In addition to green sand molds, chemically bonded sand cast systems are also used. These systems involve the use of one or more organic binders (usually proprietary) in conjunction with catalysts and different hardening/setting procedures. Chemical binders include phenolic, furfuryl alcohol, and other inorganic binders. (2) Foundry sand makes up about 97 percent of this mixture. Chemically bonded systems are most often used for "cores" (used to produce cavities that are not practical to produce by normal molding operations) and for molds for nonferrous castings. 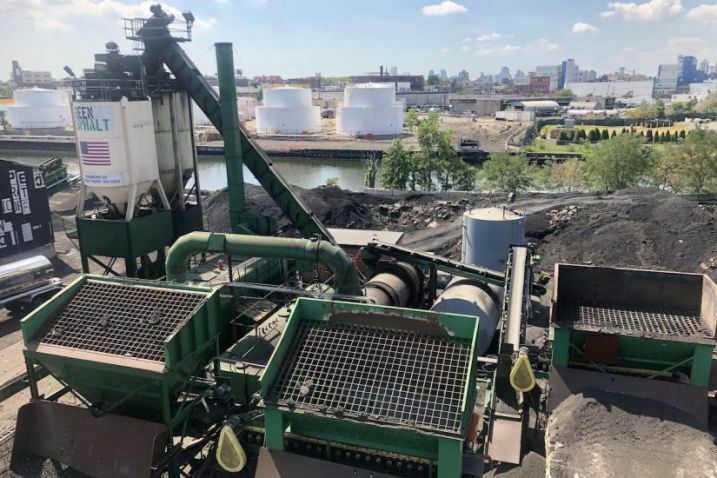 The recycling of spent foundry sand can save energy, reduce the need to mine virgin materials, and may reduce costs for both producers and end users. (6) EPA has found that spent foundry sands produced by iron, steel, and aluminum foundries are rarely hazardous. (6) Despite the support from the EPA, only about 15 percent of spent foundry sands are recycled. (6) This is mainly due to the lack of information on its possible beneficial uses. (9)Beneficial reuse of foundry sand continues to become a more accepted practice as more end-users are introduced to the concept. Links to regulations guiding the reuse of foundry sand in ten example states including: Illinois, Indiana, Louisiana, Maine, Michigan, New York, Pennsylvania, Texas, West Virginia, and Wisconsin, can be found in the State Toolkit for Developing Beneficial Reuse Programs for Foundry Sand(12) published by the U.S. Environmental Protection Agency. The link to the toolkit is below. Physical properties for spent foundry sand from green sand systems are listed in Table 1. Table 1. Typical physical properties of spent green foundry sand. In general, foundry sands are dry, with moisture contents less than 2 percent. A large fraction of clay lumps and friable particles have been reported, which are attributed to the lumps associated with the molded sand, which are easily broken up. (7) The variation in hydraulic conductivity, listed in Table 1, is a direct result of the fraction of fines in different foundry sands. Spent foundry sand consists primarily of silica sand, coated with a thin film of burnt carbon and residual binder (bentonite, sea coal, resins, etc.). Table 2 lists the chemical composition of a typical sample of spent foundry sand as determined by x-ray fluorescence. Silica sand is hydrophilic and consequently attracts water to its surface. This property could lead to moisture-accelerated damage and associated stripping problems in an asphalt pavement. Antistripping additives may be required to counteract such problems. Table 3. Typical mechanical properties of spent foundry sand. Compacted foundry sand used as a working platform and subsequently as a contributing subbase member in flexible pavement design has been studied. (27;26;28;29;30) California Bearing Ratio percentages as well as regression coefficients for the power function model to calculate Resilient Modulus, MR, are shown in Table 7-3. Laboratory and case study results show that with proper design and construction, compacted spent foundry sand provides adequate support as a working platform or subbase material. (27;26;28) Design charts for selecting the equivalent thickness of compacted foundry sand for working platforms are provided in reference 29, where a methodology for including the structural contribution of working platforms made from foundry sand or other alternative material is presented in 30. Five widely used standard leaching tests are outlined in Table 4. Models currently used to simulate leaching from pavement systems and potential impacts to groundwater include STUWMPP,(41) IMPACT,(42)WiscLEACH(43), and IWEM(44). Examples of models in the public domain include WiscLEACH and IWEM. WiscLEACH combines three analytical solutions to the advection–dispersion–reaction equation to assess impacts to groundwater caused by leaching of trace elements from CCPs used in highway subgrade, subbase and base layers. WiscLEACH employs a user friendly interface and readily available input data along with an analytical solution to produce conservative estimates of groundwater impact(43). The U.S. EPA’s Industrial Waste Management Evaluation Model (IWEM), although developed to evaluate impacts from landfills and stock piles, can help in determining whether leachate will negatively affect groundwater. IWEM inputs include site geology/hydrogeology, initial leachate concentration, metal parameters, and regional climate data. Given a length of time, the program will produce a leachate concentration at a control point (such as a pump or drinking well) that is a known distance from the source. In addition, Monte Carlo simulations can provide worst-case scenarios for situations where a parameter is unknown or unclear. In comparing IWEM to field lysimeter information, it was found that IWEM over predicted the leachate concentrations and could be considered conservative. Overall, however, it was found that IWEM performed satisfactorily in predicting groundwater and solute flow at points downstream from a source. (45) A byproducts module for IWEM will be offered by the EPA in the near future. A searchable version of the references used in this section is available here. A searchable bibliography of foundry sand literature is available here. Federal Highway Administration. Foundry sand facts for civil engineers. Federal Highway Administration (FHWA); 2004 May 2004. Report nr FHWA-IF-04-004. Winkler E, Bol’shakov AA. Characterization of foundry sand waste. Chelsea Center for Recycling and Economic Development, University of Massachusetts; 2000 Report nr 31. Abichou T, Edil TB, Benson CH, Bahia H. Beneficial use of foundry by-products in highway construction. In: Geotechnical engineering for transportation projects: Proceedings of geo-trans 2004, jul 27-31 2004. Los Angeles, CA, United States: American Society of Civil Engineers, Reston, VA 20191-4400, United States; 2004. American Foundrymen's Society. Alternative utilization of foundry waste sand, phase I. Des Plaines, Illinois: American Foundrymen's Society Inc.; 1991. Goodhue MJ, Edil TB, Benson CH. Interaction of foundry sands with geosynthetics. J Geotech Geoenviron Eng 2001;127(4):353-62. Foundry Sands Recycling, EPA530-F-07-018 [Internet]; c2007. Available from: http://www.epa.gov/epaoswer/osw/conserve/foundry/index.asp. Javed S, Lovell CW. Use of waste foundry sand in highway construction. Department of Civil Engineering, Purdue University; 1994. Report nr C-36-50N. Bastian KC, Alleman JE. Microtox™ characterization of foundry sand residuals. Waste Management 1998 7/1;18(4):227-34. Guney Y, Aydilek AH, Demirkan MM. Geoenvironmental behavior of foundry sand amended mixtures for highway subbases. Waste Manage 2006;26(9):932-45. Javed S, Lovell CW. Uses of waste foundry sands in civil engineering. Transp Res Rec 1995(1486):109-13. EPA, U.S. Environmental Protection Agency (EPA). Beneficial reuse of foundry sand: A review of state practices and regulations. 2002. EPA, Environmental Protection Agency. State toolkit for developing beneficial reuse programs for foundry sand. Environmental Protection Agency; 2006. Johnson CK. Phenols in foundry waste sand. Modern Casting 1981:273. Abichou T, Benson CH. Foundry green sands as hydraulic barriers: Laboratory study. Journal of Geotechnical & Geoenvironmental Engineering 2000 12;126(12):1174. Abichou T, Benson CH, Edil TB. Foundry green sands as hydraulic barriers: Field study. J Geotech Geoenviron Eng 2002;128(3):206-15. Naik TR, Singh SS. Performance and leaching assessment of flowable slurry. J Environ Eng 2001;127(4):359-68. Emery J, Canadian Foundry Association. Spent foundry sand - alternative uses study. Queen’s Printer for Ontario: Ontario Ministry of the Environment and Energy (MOEE); 1993. Du L, Folliard K, Trejo D. Effects of constituent materials and quantities on water demand and compressive strength of controlled low-strength material. J Mat in Civ Engrg 2002 November/December 2002;14(6):485-95. Emery J. Mineral aggregate conservation - reuse and recycling. Queen’s Printer for Ontario: Ontario Ministry of Natural Resources (MNR); 1992. CalTrans. Corrosion guidelines. California Department of Transportation Division of Engineering Services Materials Engineering and Testing Services; 5900 Folsom Blvd., Sacramento, CA 95819, 2003. Report nr Version 1.0. Ji S, Wan L, Fan Z. The toxic compounds and leaching characteristics of spent foundry sands. 2001;132(3-4):347-64. Ham RK, Boyle WC, Engroff EC, Fero RL. Determining the presence of organic compounds in foundry waste leachates. Modern Casting 1989. Ontario Ministry of Transportation. Resistance of fine aggregate to degradation by abrasion in the MicroDuval apparatus. Ontario, Canada: Ontario Ministry of Transportation; 1996. Report nr LS-619. Goodhue M, Edil T, Benson C. Reuse of foundry sands in reinforced earth structures. Madison, WI: Dept. of Civil and Environmental Engineering, University of Wisconsin-Madison; 1998. Environmental Geotechnics Report 98-12. Kleven JR, Edil TB, Benson CH. Evaluation of excess foundry system sands for use as subbase material. Transp Res Rec 2000(1714):40-8. Kleven JR, Edil TB, Benson CH. Mechanical properties of excess foundry sand for roadway subgrade. Madison, WI: Dept. of Civil and Environmental Engineering, University of Wisconsin-Madison; 1998. Report nr Environmental Geotechnics Report 98-1. Edil T, Benson C, Bin-Shafique M, Tanyu B, Kim W, Senol A. Field evaluation of construction alternatives for roadway over soft subgrade. Transp Res Rec 2000;1786:36-48. Tanyu BF, Benson CH, Edil TB, Kim W. Equivalency of crushed rock and three industrial by-products used for working platforms during pavement construction. Transp Res Rec 2004(1874):59-69. Tanyu BF, Kim W, Edil TB, Benson CH. Development of methodology to include structural contribution of alternative working platforms in pavement structure. Transp Res Rec 2005(1936):70-7. Boyle WC, Ham RK. Assessment of leaching potential from foundry process solid wastes. In: Proceedings Purdue Indiana waste conference. Purdue Indiana ed. 1979. Ham RK, Boyle WC. Leachability of foundry process solid wastes. Journal of Environmental Engineering 1981 107(1):155-170. Ham RK, Boyle WC, Engroff EC, Fero RL. Organic compounds in ferrous foundry process waste leachates. J Envir Engrg 1993;119(1):34-55. Ham RK, Boyle WC, Traeger P, Wellender D, Lovejoy M, Hippe JM. Evaluation of foundry wastes for use in highway construction. Wisconsin Departments of Natural Resources and Transportation; Madison, WI: 1993. Bin-Shafique S, Benson CH, Edil TB. Geoenvironmental assessment of fly ash stabilized subbases. University of Wisconsin – Madison, Madison, Wisconsin 53706: Geo Engineering Department of Civil and Environmental Engineering; 2002. Geo Engineering Report No. 02-03. Tikalsky P, Bahia H, Deng A, Snyder T. Excess foundry sand characterization and experimental investigation in controlled low-strength material and hot-mixing asphalt. U.S. Department of Energy; 2004. Contract No. DE-FC36-01ID13974. Wang S, Vipulanandan C. Foundry sand for highway applications. 2000. Sauer JJ, Benson CH, Edil TB. Metals leaching from highway test sections constructed with industrial byproducts. Department of Civil and Environmental Engineering, University of Wisconsin-Madison; Madison, Wisconsin 53706: 2005 Geo Engineering Report No. 05-21. Lee T, Benson C. Leaching behavior of green sands from gray-iron foundries used for reactive barrier applications. Environmental Engineering Science 2006;23(1):153-67. Harrington-Hughes K. Primer environmental impact of construction and repair materials on surface and ground waters. Transportation Research Board, National Research Council, 2101 Constitution Avenue, N.W. Washington, D.C. 20418: National Cooperative Highway Research Program; 2000. Report nr NCHRP Report 443. Hesse TE, Quigley MM, Huber WC. User’s guide: IMPACT—A software program for assessing the environmental impact of road construction and repair materials on surface and ground water. NCHRP; 2000. Report nr NCHRP 25-09. Li L, Benson CH, Edil TB, Hatipoglu B. Estimating groundwater impacts from coal combustion products in highways. November 2006 2007;159(WR4):151-63. EPA, Environmental Protection Agency. Industrial waste management evaluation model (IWEM) User’s guide. Washington, DC: US EPA; 2002. Report nr EPA530-R-02-013. EPA, Environmental Protection Agency. Guide for Industrial Waste Management [Internet]; c2006. Available from:http://www.epa.gov/epaoswer/non-hw/industd/guide/index.asp. In the United States, asphalt concrete is used to cover over 2 million miles of roadway, accounting for over 94 percent of all pavements. (1) Foundry sand has been used successfully as a partial replacement for the fine aggregate in hot mix asphalt pavements (HMA). (1;2;3;4) Some general material characteristics must be met when using foundry sand in asphalt concrete pavements. These user guidelines will summarize these characteristics and suggest useful considerations for design and construction of asphalt concrete pavements using spent foundry sand. Crushing and screening of spent foundry sand may be necessary to reduce the size of any oversize core butts or uncollapsed molds prior to use as aggregate. This is readily accomplished using conventional aggregate processing equipment (closed loop crushing and screening process equipped with magnetic separating capabilities). Manufacturing consistency (primarily gradation) is important for HMA production. Variations in sand composition that effect gradation between foundries require that spent foundry sands be examined and evaluated on a source-specific basis. Stockpiles of sufficient size should be accumulated so that product uniformity can be achieved. This may necessitate the accumulation of a substantial quantity of spent foundry sand in a central site at a specific foundry or group of foundries before transferring the material to hot mix producers. To satisfy the gradation requirements for HMA fine aggregates (AASHTO M 29),(7) the spent foundry sand must be blended with natural sand at the hot mix plant. Some of the properties of spent foundry sand that are of particular interest when used in asphalt paving applications include particle shape, gradation, angularity, absorption, clay content, durability, and plasticity. With the exception of gradation, clean, processed foundry sands can generally satisfy the physical requirements for HMA fine aggregate (AASHTO M 29). Particle Distribution: The grain size distribution of spent foundry sand is very uniform, with approximately 85 to 95 percent of the material between 0.6 mm and 0.15 mm (No. 30 and No. 100) sieve sizes. Gradation: The gradation tends to fall within the limits of a poorly graded fine sand that has relatively uniform size (passing 0.3 mm and retained 0.15 mm), with fines content ranging from 5 to 15 percent. Spent foundry sands have also exhibited a range of P-200 between a minimum of 0.9 percent and a maximum of 16.5 percent. (8) This range is caused by the different amounts of bentonite clay used by foundries. Plasticity: Spent foundry sand generated by foundries using green sand molding systems, in which bentonite clay and sea coal are added to the casting, should be examined to ensure that plasticity values are below a plasticity index of 4, the maximum allowed by AASHTO M 29. A study of Indiana foundry sand showed that eight out of 10 green sands tested had PI values below 4, yet others have found PIs ranging from non-plastic to as high as 12 percent. (2;10;11) Therefore, the plasticity index of spent foundry sand should be determined before using the sand in an asphalt mix. The potential for stripping of asphalt mixes containing spent foundry sand should be assessed in the laboratory as part of the overall mix design. Several tests are available, with the most common including: AASHTO T 283(12) which compares the tensile strength ratio of wet and dry specimens; AASTHO T 182,(13) AASHTO T 195,(14) or the Immersion Marshall test following the MTO LS-283(15) procedure, which compares the retained Marshall stability and visual appearance of Marshall briquettes before and after immersion in a heated water bath. The problem of stripping can also be mitigated by adding hydrated lime or commercially available anti-stripping additives. Conventional AASHTO pavement design methods are appropriate for asphalt paving incorporating spent foundry sand as fine aggregate. The presence of bentonite and organic binder materials can increase the time required for drying and can increase the load on the hot mix plant dust collection system (baghouse). Any coal and organic binders that are present are usually combusted in the process. The same methods and equipment used for placing and compacting conventional pavements are applicable for pavements incorporating foundry sand. STEP 1: Select gradation and conventional materials that are known to perform well based on past experience. 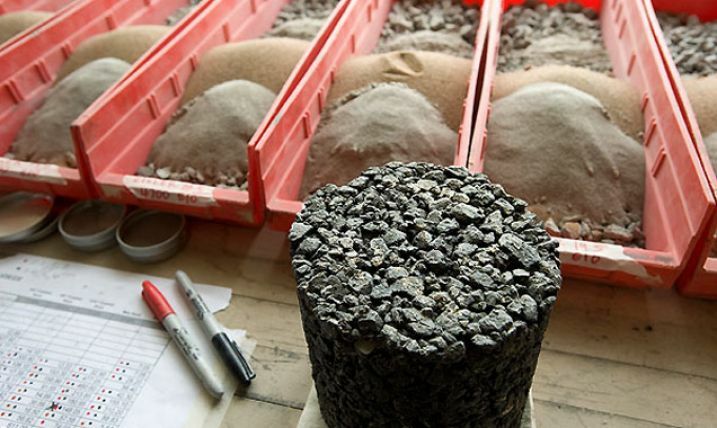 STEP 2: Obtain a representative sample of the foundry sand and conduct duplicate measures of angularity, absorption, sieve analysis dry and wet, and clay content. STEP 3: Use an optimization technique to determine optimum amount of sand to be used. The technique should include the gradation of all the materials that are going to be used, including the foundry sand. In addition, constraints for the graduation and the physical properties of fine blend or components should be included. The optimization technique suggested includes gradation limits, cost constraints, minimum angularity requirements, maximum absorption requirements, and maximum clay content requirements. STEP 4: After obtaining the optimal amounts of foundry sand and aggregates to meet the gradation and the physical property requirements, mix design procedure should be carried out. Select 3 or 4 asphalt contents based on previous tests to mix with the aggregates. Select compaction levels that meet the traffic volume and the local air temperature range following the Superpave volumetric mixture design procedure. STEP 5: Following the mixing and compaction of the HMA mixtures containing foundry sand, measurements of the samples volumetric properties should be completed. Based on the volumetric results, an optimal asphalt content should be determined to achieve 4 percent air voids. If the volumetric properties failed to meet the Superpave mix design requirements, reexamination of the gradation and the optimization process should be performed. Return to step 1 for selecting new gradation and/or materials. STEP 6: Hot mix asphalt mixtures at the optimum asphalt content should be mixed and compacted to achieve 7 percent air voids following the AASHTO T 283(12) test procedure. The samples should be examined for moisture susceptibility. If the samples failed, an anti-stripping additive, such as hydrated lime, should be added to the mix, and reexamination should take place. There is a need to establish standard methods of assessing the suitability of spent foundry sand for HMA use. The Immersion Marshall test appears to be appropriate for assessing stripping potential. Also, the influence of spent foundry sand on the moisture susceptibility of HMA should be studied further. The University of Wisconsin-Madison is currently developing better methods to quantify clay and organic-based additives to predict how foundry sands influence moisture damage. (1) There is also a need to further understand the potential for phenol discharges from foundry sand stockpiles, and to determine appropriate treatment strategies, if necessary. Federal Highway Administration. Foundry sand facts for civil engineers. Federal Highway Administration (FHWA); 2004 Report nr FHWA-IF-04-004. Javed S, Lovell CW, Wood LE. Waste foundry sand in asphalt concrete. Transportation Research Record 1994(1437):27-34. Javed S, Lovell CW. Use of waste foundry sand in highway construction. Department of Civil Engineering, Purdue University; 1994 Report nr C-36-50N. Collins RJ, Ciesielski SK. Recycling and use of waste materials and by-products in highway construction. Washington, DC: Transportation Research Board; 1994. Report nr National Cooperative Highway Research Program Synthesis of Highway Practice 199. Delange K, Braham A, Bahia H, Widjaja M, Romero P, Harman T. Performance testing of hot mix asphalt produced with recycled foundry sand. In: Annual Meeting of the Transportation Research Board; 2001. Hughes C. Recycled foundry sand in the mix. Hot Mix Asphalt Technology 2002:29-38. AASHTO. Fine aggregate for bituminous paving mixtures, part I specifications. Washington, DC 20001: American Association of State Highway and Transportation Officials; 2003. Report nr M 029-03. Miller E, Bahia HU, Benson C, Khatri A, Braham A. Utilization of waste foundry sand in hot mix asphalt mixtures. American Foundry Society Transactions 2001;103(1):1393-407. Abichou T, Benson C, Edil T. Beneficial reuse of foundry sands in construction of hydraulic barrier layers. Madison, WI: Dept. of Civil and Environmental Engineering, University of Wisconsin-Madison; 1998. Report nr Environmental Geotechnics Report 98-2. AASHTO. Resistance of compacted bituminous mixtures to moisture induced damage, part II testing. Washington, DC 20001: American Association of State Highway and Transportation Officials; 2003. Report nr T283-03. AASHTO. Coating and stripping of bitumen-aggregate mixtures, part II testing. Washington, DC 20001: American Association of State Highway and Transportation Officials; 1986. Report nr T182-84. AASHTO. Determining degree of particle coating of bituminous-aggregate mixtures, part II testing. Washington, DC 20001: American Association of State Highway and Transportation Officials; 1986. Report nr T195-67. Ontario Ministry of Transportation. Resistance to stripping of asphaltic cement in bituminous mixture by immersion marshall - laboratory testing manual. Ontario Ministry of Transportation; 1995. Report nr LS 283. Tikalsky P, Bahia H, Deng A, Snyder T. Excess foundry sand characterization and experimental investigation in controlled low-strength material and hot-mixing asphalt. U.S. Department of Energy; 2004. Report nr Contract No. DE-FC36-01ID13974. D’Allesandro L, Haas R, Cockfield RW. Feasibility study on the environmental and economical beneficial use of waste foundry sand in the paving industry. University of Waterloo; 1990:Report for MRCO and the Canadian Foundry Group. AASHTO. Sampling bituminous paving mixtures, part II tests. Washington, DC 20001: American Association of State Highway and Transportation Officials; 2003. Report nr T168-03. ASTM D2726-05a Standard test method for bulk specific gravity and density of non-absorptive compacted bituminous mixtures. In: Annual book of ASTM standards. West Conshohocken, Pennsylvania: ASTM; 2005. ASTM D2950-05 Standard test method for density of bituminous concrete in place by nuclear methods. In: Annual book of ASTM standards. West Conshohocken, Pennsylvania: ASTM; 2005. The specifications in most jurisdictions for flowable fill materials require that aggregates satisfy ASTM C33. (9) While spent foundry sand may not satisfy the gradation requirements of ASTM C33 for fine aggregates, the uniform, spherical nature of the particles produces a relatively free-flowing mixture. Crushing spent foundry sand may be necessary to reduce the size of oversize core butts or uncollapsed molds. The spent foundry sand can also be screened and oversize material from molds and cores that have not completely collapsed should be removed. For spent foundry sand to be suitable as a replacement for fine aggregate in flowable fill, the sand should be free of objectionable material such as wood, garbage, and metal that can be introduced at the foundry. In addition, the sand should be free of thick coatings of burnt carbon, binders, and mold additives that could inhibit cement hydration. Stockpiles of sufficient size should be accumulated and blended so that a consistent gradation can be achieved before transferring the material to ready-mix concrete plants/flowable fill producers. (12) When aggregates must satisfy the requirements of ASTM C33, the spent foundry sand should be blended with natural or other suitable fine aggregate materials to meet gradation requirements. The presence of organics (from some binder systems such as bentonite clay) may exceed ASTM C33 criteria and therefore should be closely monitored. Some of the engineering properties of spent foundry sand that are of particular interest when foundry sand is used in flowable fill applications include particle shape, gradation, strength characteristics, soundness, deleterious substances, and corrosivity. Particle Shape: The grain size distribution of spent foundry sand is more uniform and somewhat finer than conventional concrete sand. (15) The fineness of spent foundry sand contributes to good suspension, limiting segregation of flowable fill. The spherical shape of spent foundry sand particles contributes to good flow characteristics. Gradation: Spent foundry sand may not satisfy the ASTM C33 gradation requirement; therefore, it may need to be blended with natural sand or other suitable fine aggregate materials to meet the requirements. Hydraulic conductivity: The average hydraulic conductivity of foundry sand flowable fill is between 7.2x10-5 and 2.6x10-6 cm/s. (1;14;13) Lower hydraulic conductivity occurs with higher cementitious content. Higher fly ash mixtures exhibit a decreased permeability likely due to densification of material microstructure from pozzolanic reaction of the fly ash (Table 6). Many jurisdictions specify the use of fine aggregates conforming to ASTM C33 in flowable fill, which generally precludes using spent foundry sand unless it is blended with natural sand or other suitable materials. For bentonite contents greater than 6 percent, no fly ash is necessary because the bentonite will be sufficient to prevent segregation. For bentonite contents less than 6 percent, some fly ash is necessary. The mixes in Table 7 can be used as starting point for mix design. Structural design procedures for cured flowable fill materials are no different than geotechnical design procedures for conventional earth backfill materials. The procedures are based on using the unit weight and shear strength of the flowable fill to calculate the bearing capacity and lateral pressure of the material under given site conditions. The same methods and equipment used to mix, transport, and place flowable fill made with conventional aggregates may be used for flowable fill incorporating spent foundry sand. Flowable fill can be produced at a central concrete mixing plant in accordance with ASTM C94(9) and delivered by concrete truck mixers or using a mobile, volumetric mixer for small jobs. High fluidity (slump greater than 150 mm (6 in)) should be maintained to ensure that the flowable fill material entirely fills all voids beneath pavements and around structures and utilities. Leaching of metals from flowable fill is a long process due to the low permeability of the material. Some leaching will occur, however, through diffusion and the permeation of liquid through the mix if the permeability is high enough. The results of a study of leachates from flowable fill mixtures containing foundry sand and Class F fly ash are presented in Table 8. The leachate results of these CLSM materials were below the enforcement standards of the Wisconsin Department of Natural Resources ground-water quality standards and also met practically all the parameters of the drinking water standards. Most existing specifications require that the fine aggregate for flowable fill satisfy ASTM C33. Since foundry sand does not meet the gradation requirements of this standard, there is a need to review gradation requirements and investigate the impact of alternative gradations to permit wider use of spent foundry sand for this application. Bhat ST, Lovell CW. Design of flowable fill: Waste foundry sand as a fine aggregate. Transp Res Rec 1996(1546):70-8. Ambroise JA, Amoura, Pera J. Development of flowable high volume - fly ash mortars. In: 11th international symposium on the use and management of coal combustion by-products (CCBs). American Coal Ash Association; 1995. Dingrando JS, Edil TB, Benson CH. Beneficial reuse of foundry sands in controlled low strength material. Journal of ASTM International 2004;1(6):15-30. ACI Committee 229. Controlled low strength materials. Concrete International 1994;16(7):55-64. Adaska WS, Krell WC. Bibliography on controlled low-strength materials (CLSM), Concrete International 1992;14(10):42-3. Naik TR, Ramme BW, Kolbeck HJ. Filling abandoned underground facilities with CLSM fly ash slurry. Concrete International 1990;12(7):19-25. Larsen RL. Sound uses of CLSM in the environment. Concrete International 1990;12(7):26-9. Newman FB, Di Gioia AM, Rojas-Gonzalez LF. CLSM backfills for bridge abutments. 11th International Symposium on the use and Management of Coal Combustion by-Products (CCBs) 1995;2. ASTM C33-03 standard specification for concrete aggregates. In: Annual book of ASTM standards. West Conshohocken, Pennsylvania: ASTM; 2003. Smith E. A review of the literature on the beneficial use of spent foundry sand in flowable fill. The Pennsylvania State University: Dr. Paul J. Tikalsky; 1996. Leidel DS, Novakowski M, Pohlman D, MacRunnels ZD, MacKay MH. External beneficial reuse of spent foundry sand. AFS Transactions 1994;102. Naik TR, Singh SS. Permeability of flowable slurry materials containing foundry sand and fly ash. J Geotech and Geoenvir Engrg 1997;123(5):446-452. Naik TR, Singh SS. Performance and leaching assessment of flowable slurry. J Environ Eng 2001;127(4):p359. Tikalsky P, Gaffney M, Regan R. Properties of controlled low-strength material containing foundry sand. ACI Materials Journal 2000;97(6). Abichou T, Edil TB, Benson CH, Bahia H. Beneficial use of foundry by-products in highway construction. In: Geotechnical engineering for transportation projects: Proceedings of geo-trans 2004, jul 27-31 2004. Los Angeles, CA, United States: American Society of Civil Engineers, Reston, VA 20191-4400, United States; 2004. ID: 32; Compilation and indexing terms, Copyright 2006 Elsevier Inc. All rights reserved. Javed S, Lovell CW. Use of waste foundry sand in highway construction. Department of Civil Engineering, Purdue University; 1994 July, 1994. Report nr C-36-50N. Emery J. Mineral aggregate conservation - reuse and recycling. Queen’s Printer for Ontario: Ontario Ministry of Natural Resources (MNR); 1992 February, 1992. Lee K, Cho J, Salgado R, Lee I. Retaining wall model test with waste foundry sand mixture backfill, GTJODJ 2001;24(4):401-408. PCA. Cementitious grouts and grouting. Skokie, Illinois: Portland Cement Association; 1990. Winkler E, Bol’shakov AA. Characterization of foundry sand waste. Chelsea Center for Recycling and Economic Development, University of Massachusetts; 2000 October 2000. Report nr 31. AASHTO. Sieve analysis of fine and coarse aggregates, part II tests. Washington, DC 20001; Washington, DC 20001: American Association of State Highway and Transportation Officials; 2006. Report nr T027-06. ASTM D6103-04 standard test method for flow consistency of controlled low strength material (CLSM). In: West Conshohocken, Pennsylvania: ASTM; 2007. ASTM D6023-02 standard test method for unit weight, yield, cement content, and air content (gravimetric) of controlled low strength material (CLSM). In: West Conshohocken, Pennsylvania: ASTM; 2007. Note: The use of foundry sand in Portland cement and Portland cement concrete mixtures is an emerging application area. Published research and case studies on this subject are limited. As such, the use of foundry sand for this application is not well documented, and any use of foundry sand in Portland cement should be considered somewhat experimental. Publication of such uses and laboratory research would aid in the understanding of the performance of foundry sand in Portland cement. Portland cement concrete is a commonly used paving material that consists of approximately 45 percent coarse aggregate, 25 percent fine aggregate, 20 percent cement and 10 percent water. (1) It has been shown that foundry sand can be used in concrete production as a replacement of the fine aggregate portion of the mixture. (1) The following guideline was developed to provide the foundry sand user a comprehensive summary of foundry sand in terms of its physical properties as well as additional design considerations when incorporating foundry sand into Portland cement mixtures. Various characteristics of foundry sand can affect the quality of concrete produced. Because foundry sand properties vary depending on the source from which the foundry sand was produced, it is important that adequate testing of the sand is performed. The material characteristics that are most relevant in Portland cement applications include particle size distribution, dust content, density, specific gravity, organic content, and grain shape. (1) These characteristics are described in further detail below. Particle Size Distribution: The fine aggregate particle size distribution of Portland cement is an important characteristic as it can affect concrete workability, porosity, shrinkage and durability. In particular, too many fine particles can lower the concrete strength and adversely affect durability. ASTM C33(2) requires that the fine aggregate used in concrete have a fineness modulus, an index of aggregate fineness, in the range of 2.3 to 3.1. (1) The fineness modulus of foundry sand typically ranges from 0.9 to 1.6. (1) Generally foundry sand is too fine to permit full substitution. The sand has to be blended with a coarser material to meet this specification. In some areas, natural sands lack finer material. Foundry sand can be blended with them as a partial replacement to satisfy the specification. Density: According to ASTM C330, the density of fine aggregate must be a minimum of 1.20 to 1.76 g/cm3 (75-110 lbs/ft3). (1) A higher density aggregate is required when the concrete will be subjected to high compressive loads. Specific Gravity: The specific gravity of foundry sand varies from 2.5 to 2.8, depending on the source, which compares very favorably to natural sands. (1) Although specific gravity does not directly relate to concrete quality, it can be used as a quality control indicator. Grain Shape: Foundry sand particles are typically angular to rounded. (1) Round particles are desired as they need less water and cement to coat their surface, and they produce a mixture that is more workable. In contrast, angularity increases water demand and cement content to maintain a workable mix. In general, further investigation is needed to determine appropriate mix designs of Portland cement that account for the variability in material properties of foundry sand. Zirschky J, Piznar M. Cement stabilization of foundry sands. J Envir Engrg 1988;114(3):715-718. The major components of foundry sand are quartz sand (70 to 80 percent), clay (5 to 15 percent), additives (2 to 5 percent), and water (up to 4 percent). (8) Chemical binders include phenolic, furfuryl alcohol, and other inorganic binders. (8) Specific gravity ranges from 2.39 to 2.70. (12;13;14)Grain size distribution is very uniform, with nearly all spent sands containing particles in the range of 0.6 to 0.15 mm. (4) The plasticity index for clay-bound foundry sand can range from nonplastic to 12 percent. (14) The consistency and uniformity of foundry sand may make it a better engineering material than naturally occurring sand. For design with geosynthetics, interaction coefficients from pullout tests ranged from 0.2 and 1.7 in the normal stress range of 10 to 50 kPa (209 to 1044 lb/ft2). (13) Recommendations for design include a frictional efficiency (Eφ = tanδ / tanφ), woven geotextile interaction coefficients (Ci), and geogrid interaction coefficients are shown in Table 5. The use of foundry sand as an embankment of fill material is an unencapsulated use and therefore has the potential for contaminant leaching. For leachate testing in embankment applications, the synthetic precipitation leaching procedure (SPLP) is believed to be most representative of fill applications. (21) Use of foundry sand in embankments and as a fill requires good management and care to ensure that no negative impacts occur to the environment. In particular, areas with sandy soils possessing high hydraulic conductivities and areas near shallow groundwater or drinking aquifers should be given careful consideration. An evaluation of groundwater conditions, applicable state test procedures, and water quality standards should be consulted, as well as ensuring proper construction and environmental modeling. Partridge BK, Fox PJ, Alleman JE, Mast DG. Field demonstration of highway embankment construction using waste foundry sand. Transp Res Rec 1999(1670):98-105. Ham RK, Boyle WC. Leachability of foundry process solid wastes. Journal of Environmental Engineering 1981;107(1):155-170. Lovejoy MA, Ham RK, Traeger PA, Wellander D, Hippe J, Boyle WC. Evaluation of selected foundry wastes for use in highway construction. In: Proceedings of the 1996 19th international Madison waste conference, sep 25-26 1996. Madison, WI, USA: University of Wisconsin-Madison/Extension, Madison, WI, USA; 1996. Winkler E, Bol’shakov AA. Characterization of foundry sand waste. Chelsea Center for Recycling and Economic Development, University of Massachusetts; 2000. Report nr 31. Fox PJ, Mast DG. Geotechnical performance of a highway embankment constructed using waste foundry sand. Purdue Libraries; 1998. Report nr FHWA/IN/JTRP-98/18. Fox PJ, Mast DG. Salvaged sand. Civil Engineering 1997;67(11):53. Mast DG. Field demonstration of a highway embankment using waste foundry sand. West Lafayette, ID: Purdue University; 1997. ASTM D560-03 standard test methods for freezing and thawing compacted soil-cement mixtures. In: Annual book of ASTM standards. West Conshohocken, Pennsylvania: ASTM; 2003. Freber BW. Beneficial reuse of selected foundry waste material. In: Proceedings of the 1996 19th international Madison waste conference. Madison, WI, USA: University of Wisconsin-Madison/Extension, Madison, WI, USA; 1996. Lee T, Benson C. Using foundry sands as reactive media in permeable reactive barriers. Madison, WI: Dept. of Civil and Environmental Engineering, University of Wisconsin-Madison; 2002. Report nr Geo Engineering Report 02-01. Coz A, Andres A, Soriano S, Irabien A. Environmental behavior of stabilized foundry sludge. J Hazard Mater 2004 2004 Jun 18;109(1-3):95-104.